Hunter took on the role of Office Manger in May 2018. Hunter is a Georgia native, her love of animals was passed down from her mother and grandmother. 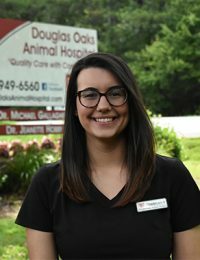 She grew up around multiple types of animals, but started working as a veterinary assistant in 2014. In her free time she enjoys playing fetch with her dog Paco, and spending time with her husband, Bryan.